To add an image to the service plan you can either put it into a slideset or add it directly. This page is about adding a single image. It is possible also to add a set of images as a single item in a service plan, but it might be easier to do this by putting them into Powerpoint. To add an image, show the images in the library by clicking on the Images bar. 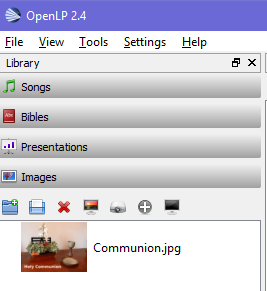 Images are held in folders within the library. In general, images for just a single service should be put in the 'One-off' folder and those for repeated use in the 'Regular' folder. The contents of the folders can be shown or hidden by clicking on the arrow symbol to the left of the folder name. Then add it to the library by clicking on the second leftmost symbol below Images. Then add it to your plan using the ⊕ symbol.